Welcome to our Hazard Perception Test 2019 FAQ page which contains some of the most frequently asked questions by learner car drivers and motorcyclists. If you have a question regarding the Hazard Perception Test 2019 that you can't find the answer to don't worry, just drop us a line and we'll do our very best to get back to you as soon as we can. Do I have to sit the Hazard Perception Test at the same time as the Theory Test? If you are a learner car driver or a learner motorcyclist you will need to sit both the multiple choice part of the Theory Test followed by the Hazard Perception Test on the same day. You will need to pass both parts in order to receive your Theory Test certificate. Can I take my theory and Hazard Perception Test before I start learning to drive? Yes, as long as you have obtained your UK provisional driving licence you can take your Theory and hazard test before you start your driving lessons. Do I have to click directly on the hazard? No, you do not have to click on the hazard. Simply click the mouse button anywhere on the screen and you will see a small red flag appear at the bottom of the screen. How many video clips are in the Hazard Perception Test 2019? For learner car drivers and motorcyclists there are currently 14 video clips you have to click on. How many hazards will I be scored on? There are 15 scorable hazards for learner car drivers and motorcyclists. What are the maximum points you can score for each clip? The maximum points you can score for each hazard in the learner car driver and motorcycle test is 5 points. However, please be aware that there is one clip in the test that will contain 2 hazards, so you’re total score for this clip will be 10 points. What is the pass mark for the Hazard Perception Test 2019? The pass mark for learner car drivers and motorcyclists is 44 out of 75. How can I avoid being accused of cheating? The test has a built-in cheat detection system, so you must be aware that you’re not clicking too often. There is a fine line between clicking enough times to be sure that you score the maximum points and clicking so often that the test software considers you to be cheating. For hints on how to avoid being accused of cheating visit our Hazard Perception page. When was the Hazard Perception Test introduced? The test was introduced into the Theory Test on the 14th of November 2002. When should I click in the test? You should click as soon as possible when you see a developing hazard. The earlier you click the more points you will score. If the hazard changes or becomes more serious you should click again. For further information on how to score the maximum points visit our Hazard Perception page outlining where and when you should click. Can I lose marks in the test? Yes, if you click too often in the same video clip, the computer may think that you are cheating and you will score zero for that particular clip. Are there any good sites to help prepare me for my test? 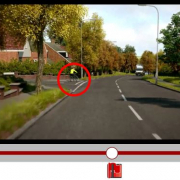 Driving Test Success Online contains hundreds of Hazard Perception video clips that accurately simulate the official DVSA Hazard Perception Test. Each clip can be reviewed so you can learn to understand how hazards develop and how the maximum scores can be achieved. You’ll even find a detailed progress monitor that will keep track of all your practise sessions and mock tests. Visit Driving Test Success Online for all our revision products. Are there any training resources for a DVD player? Don’t worry if you haven’t got a PC or laptop or would prefer to practise for your Hazard Perception Test using your DVD player, Xbox 360, PS3 or MAC, you can purchase a copy of Driving Test Success All Tests DVD. Where can I find free online Hazard Perception Test 2019 training? You can register for a FREE trial to Driving Test Success Online which contains hundreds of hazard perception video clips; perfect for preparing you for the second part of your Theory Test! What if I prefer using an app? Our award-winning Driving Theory Test 4 in 1 App was voted as Apple's No.1 paid app for 2018, proving just how popular this app is! You'll be able to master the Hazard Perception Test using our 85 fully interactive clips (including the 20 licensed 20 DVSA CGI clips with cheat detection software), in addition to everything you could ever need to pass the complete 2019 Theory Test.